In July 1969, ninety-four percent of American televisions were tuned to coverage of Apollo 11’s mission to the Moon. How did space exploration, once the purview of rocket scientists, reach a larger audience than Laugh-In? Why did a government program whose standard operating procedure had been secrecy turn its greatest achievement into a communal experience? 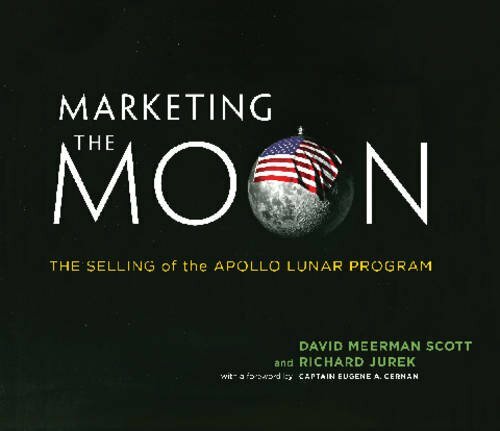 In Marketing the Moon, David Meerman Scott and Richard Jurek tell the story of one of the most successful marketing and public relations campaigns in history: the selling of the Apollo program. Primed by science fiction, magazine articles, and appearances by Wernher von Braun on the “Tomorrowland” segments of the Disneyland prime time television show, Americans were a receptive audience for NASA’s pioneering “brand journalism” and “content marketing.” Scott and Jurek describe sophisticated efforts by NASA and its many contractors to market the facts about space travel—through press releases, bylined articles, lavishly detailed background materials, and fully produced radio and television features—rather than push an agenda. American astronauts, who signed exclusive agreements with Life magazine, became the heroic and patriotic faces of the program. And there was some judicious product placement: Hasselblad was the “first camera on the Moon”; Sony cassette recorders and supplies of Tang were on board the capsule; and astronauts were equipped with the Exer-Genie personal exerciser. Everyone wanted a place on the bandwagon. Generously illustrated with vintage photographs, documents, and advertisements, many never published before, Marketing the Moon shows that when Neil Armstrong took that giant leap for mankind, it was a triumph not just for American engineering and rocketry but for American marketing and public relations.